Suanla Chaoshou, aka Wontons in Red Chili oil or Szechuan (or Sichuan) Wontons, are fast becoming my favorite dumpling preparation. This dish is pork wontons served with a chili oil dressing, as J. Kenji López-Alt on SeriousEats aptly put it, “Sweet and savory. Slippery and slick. Juicy and tender. Hot and sour. Garlicky. So. Freaking. Good.” There are some variations to the sauce that include crushed peanuts or sesame paste, but the essentials to the aromatic sauce are sesame oil, vinegar, garlic, and roasted chili oil. I tried Suanla Chaoshou recently at Shanghai Asian Cuisine and Ollies Sichuan. I mainly know Ollies from their prior Manhattan Upper West Side locations near Columbia University and near Lincoln Center, which were locally known as Oil-lies and sold American-Chinese food. But my Chinese colleague told me that Ollies Sichuan in midtown was serving legit Sichuan dishes and that he would do the ordering to make sure I tasted the good stuff. Some of the dishes he ordered are not on the official menu, Fuqi Feipian 夫妻肺片 (beef tendon and offal in chili sauce) and Suan Cai Yu 酸菜鱼 (hot and sour fish soup with pickled mustard greens), but can be ordered by talking to the waiter. The beef dish was not to my taste, but the fish dish was amazing, as were the Sauteed Green Pea Stems. The menu has Wonton in Red Sesame Oil with one chili emoji next to it and Pork Dumplings in Red Chili Oil with three chili emojis next to it. I went for the three chili version and was pretty disappointed. The dumplings were large and plump and the sauce was spicy, but the sauce lacked any other flavor, no sweet, sour or garlic and the pork filling was bland. The spice level was also a lot lower than the other dishes we ordered, so eating them isn’t even really a challenge you can brag about. Shanghai Asian Cuisine is known for its soup dumplings, Sheng Jian Bao and Shanghai Wonton Soup, but also sells Wonton Szechuan Style. The sauce was comprised of red chili oil floating on a red paste, which I think was fermented bean or mashed red peppers and garlic. The sauce was excellent, it had a full on spicy kick, sweet and sour notes and an umami and earthy funk from the paste. The wontons had crinkly skins with excess noodle and lots of surface area that the sauce could cling to. 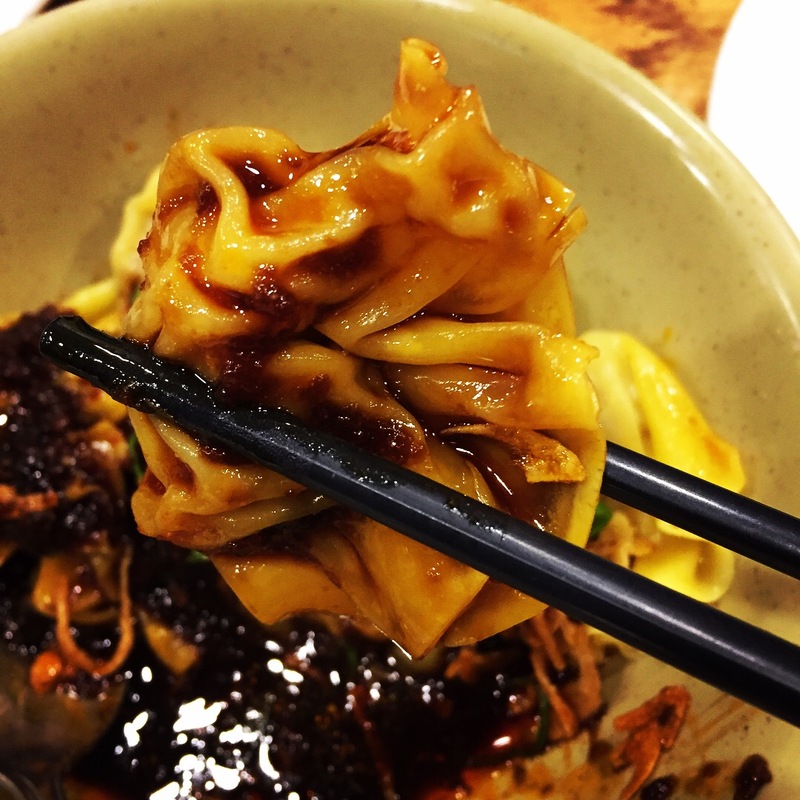 The Shanghai-ese restaurant won this battle of Sichuan Wontons. Go to Ollies Sichuan for the amazing hot and sour fish soup and skip the Pork Dumplings with Red Chili Oil. Shanghai Asian Cuisine is on Elizabeth Street between Canal and Bayard Streets in Manhattan’s Chinatown. Ollies Sichuan is on 42nd street near 9th Avenue in Manhattan’s Hell’s Kitchen neighborhood. 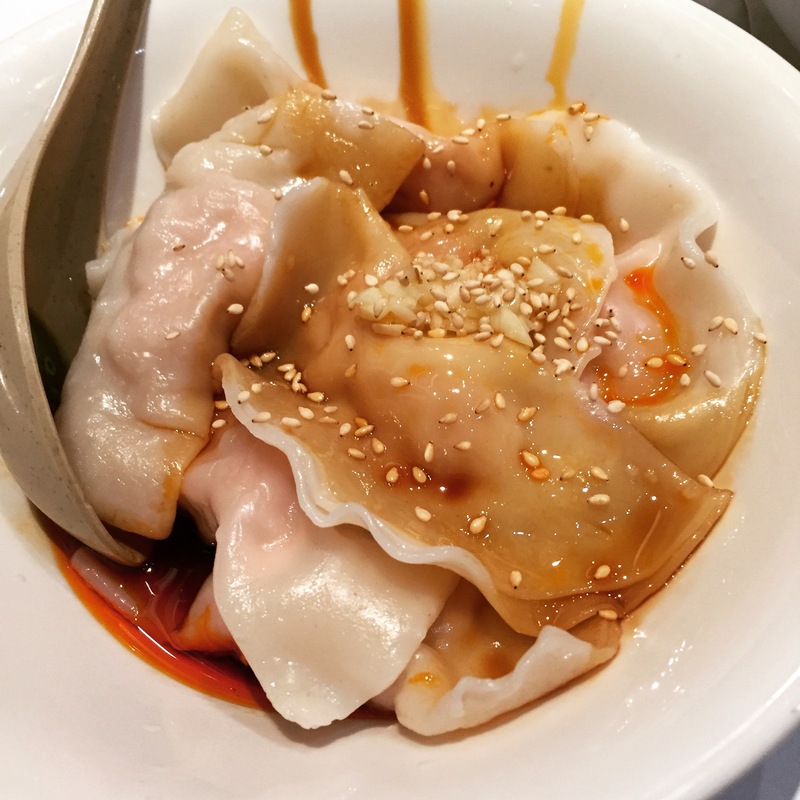 This entry was posted in New York City, Sichuan Dumplings, Wontons. Bookmark the permalink.